Take your child on a railway journey to endless creative play possibilities with the LEGO® DUPLO® Train Accessory Set! 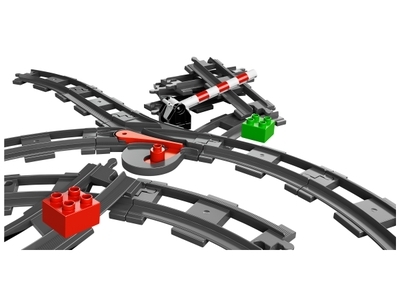 Features 8 curved rails, 5 straight rails, 2 sets of points and a crossing for lots of track combinations. With assorted basic and decorated DUPLO bricks, the Train Accessory Set is the perfect addition to any DUPLO train collection. Last known price is 5% above the initial Lego retail price! The Train Accessory Set (10506) Lego set is no longer directly available from the sites below. However, 3rd party partners of these sites might still have the set available. Alternate description Expand your child’s train fun with the LEGO® DUPLO® Train Accessory Set with curved and straight rails, points, a crossing and DUPLO bricks! Combine with your existing DUPLO train collection!